Yet another month has past on my journey to build my own arcade cabinet. The second month has seemed somewhat slower in progress, although I did get a few important things done. 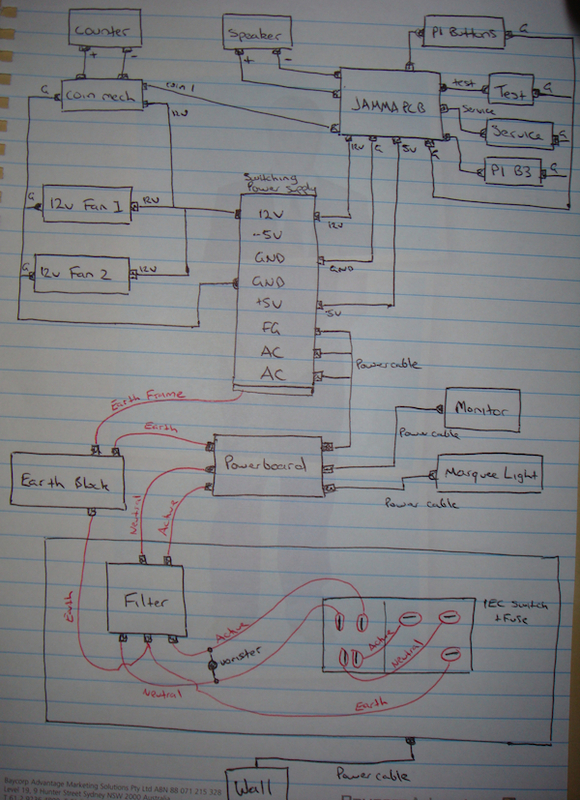 The biggest of which was the plans for the internal wiring. I also took some time to grab images of Galaga cab projects other people had done, and got them printed at photos to use as reference material as I’m building. A wise $5 investment I think. I purchased a number of wiring bits also to round the month off – not quite as exciting as researching and buying coin mechs, game boards or controls, but still important. I think month 3 will see the most physical progress for the cab, as I expect the shell to be built and painted. The power wiring will be done and most internal components installed. With any luck, all that will remain at the end of the month will be some artwork and touch ups. My search for T Molding was fairly simple. There are a number of places here in Australia that sell it. Most online arcade shops have some available – it all depends on the thickness, colour and texture you are after. My first purchase was from GameDude, which had the Galaxian Green I was wanting for my cab. This was priced at $12.50 per 10 feet. I thought this was ok. But I have since discovered T-Molding.com which has an awesome selection, and is even cheaper (despite being located in the states). For the same Galaxian green, I was able to purchase 20 feet for $10US (roughly $11AU). When postage was added, I was up for $20.78AU for the 20 feet (compared with close to $30 from GameDude). T-Molding.com is well worth checking out when you are looking for t-molding for your arcade cabinet. The only real drawbacks I found was you are forced to purchase in increments of 20 feet and maybe have an extra few days to wait. Yep – I’m putting up a post dedicated to a catalgoue. The Jaycar catalogue to be exact. 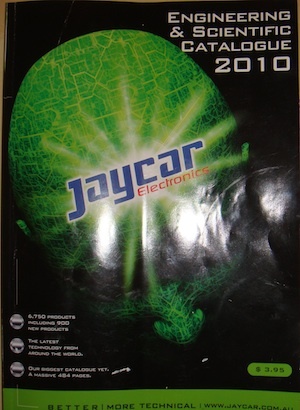 While looking for parts and tools to help build the cab, I was constantly looking over the Jaycar site which has a lot of parts to help wire it up. After much searching on the site (and a few small orders), I decided to purchase the catalogue (cost $3.95AU) and it was a very wise decision. I found a number of things I couldn’t find on the site, plus some extra’s I had not considered. It made my final order much easier, and also helped clear up some terminology issues (which helped with my part / product searches). If you are looking at getting some internal parts for your cab, I’d recommend getting their catalogue. I have put together an initial plan for the wiring of the cab. Most of it is very straight forward. The only tricky bit really is the power wiring. But after sketching out a few plans, and getting some expert advice from experienced cab builders, I think it has come together nicely and is fairly straight forward. Another thing I like about this plan is it should help ensure the insides of the cab are tidy, organised and easy to maintain (not to mention safety first also!). I’ve added in a filter and varister to deal with spikes that may come through, but probably the biggest decision I made was to use a power board to power the key components of the cab. This makes the wiring simpler, and certainly easier to replace, expand or upgrade features. So things like the monitor, switcher and marquee lighting can all plug directly into the power board. It will increase the cost slightly, but not much. In the end, I think its going to work really well.